Big Finish: Sherlock Holmes - The Reification of Hans Gerber Review | Warped Factor - Words in the Key of Geek. Andrew East continues his journey through the audio adventures of Sherlock Holmes. 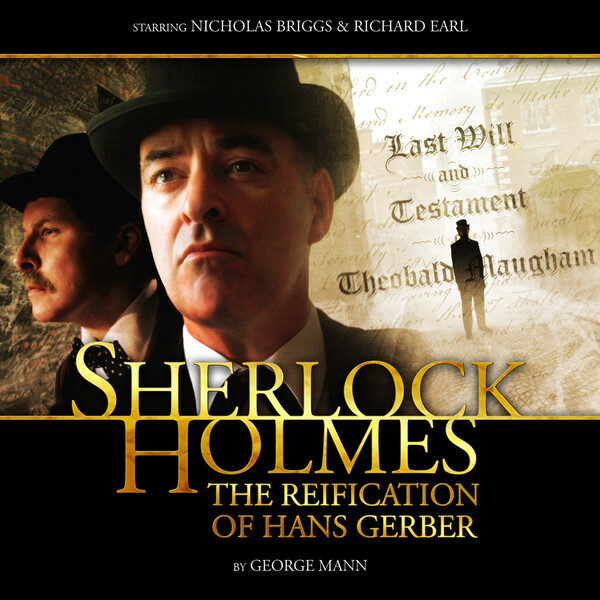 The Reification of Hans Gerber is Big Finish’s first original Sherlock Holmes audio story. Written by George Mann, it involves Holmes and Watson investigating a seemingly accidental death, a missing will and a long-lost relative. If proof were needed at how good Big Finish are at audio drama, this story is strong evidence. Just as with Doctor Who, the production team of Big Finish have created a story which feels authentically Conan Doyle; and the lion’s share of the credit must go to Mann’s wonderful script. All the elements are here: a family with secrets; brutal murders; chases round fogbound London streets; disguise and hidden identities; a plethora of intriguing clues. Across these audio reviews, I have praised the work of Nicholas Briggs as Holmes and Richard Earl as Watson and this story is no different. Earl is given a huge amount of narration – very in keeping with Conan Doyle’s style – which provides the listener with a perfect evocation of both the Holmesian style and Victorian life. Briggs continues to impress as Holmes. He is often criticised for his work at Big Finish with some fans feeling he has too much control and that this has a detrimental effect on the Doctor Who range. I’ve said it before that much of this criticism clearly stems from jealousy or the ‘not how I would do it’ brigade. The Sherlock Holmes range proves what a great actor Briggs has the capacity to be. Admittedly, his bit part appearances across the Doctor Who range can become a little distracting, but there is no denying he has become the quintessential Dalek voice. Here, in Sherlock Holmes he, for me, gives Clive Merrison a run for his money as the better audio Holmes. The rest of the cast for this story is extensive and it wasn’t until listening to the audio interviews at the end of each disc that I realised who was involved. : John Dorney, Dan Starkey and Terry Molloy all lend their voices to the cast. Everyone is pitch perfect and, in particular, it is fun to listen to Molloy’s Inspector Bainbridge – a police inspector that Holmes actually likes (or tolerates as he insists, much to Watson’s amusement). The eponymous Hans Gerber provides the focus for this story and he is an intriguing character. Only once is he given ‘voice’ and, unfortunately, it is very obvious who is ‘being’ Gerber. When the truth is revealed later in the story, I did feel slightly underwhelmed having already worked that aspect out. It is something which would have been hidden much better were this a prose version of the story, but it does hark back to aspects of The Hound of the Baskervilles. Before this story, I had never heard of the word - reification. The definition is ‘to make real’ which is what eventually happens to Gerber – although in two different ways. I’m not sure many people have ever heard of this word either, and this clearly extends to the cast and production team who don’t seem to be able to agree on how it should be pronounced. Some pronounce it ‘righ – fication’ and some ‘ray –i-fication’. Either way it is always pleasant to be educated but, going in to the story, I actually had no idea what I was expecting because I had no idea what the title even meant! My marathon has been about watching/listening/reading stories in chronological order. Working out the order of the Sherlock Holmes stories has caused me some problems and this one was a sticking point for some time. The only information I could glean was that the story was 19th Century and so I initially placed it towards the end of my marathon. Listening to it, however, has revealed that – from some very clear story details – this is set much earlier in the Holmes canon. The main evidence is that Watson’s wife, Mary is still alive. Mary dies between The Final Problem and The Empty House (as far as I can ascertain) meaning this story must be set before The Final Problem. As to an exact year, well that is purely guesswork so I have plumped for c1890. I highly recommend The Reification of Hans Gruber (which is why I have avoided revealing too many plot details). As an original Sherlock Holmes story it is well written, contains all the requisite ingredients, has a strong cast and sound design and provides solid entertainment. On the strength of this audio, I am keen to seek out Big Finish’s other original Holmes stories as I hazard a guess that this range will prove to be another jewel in their crown.